Rarely has a book so packed with accurate and well researched factual information been so widely read and popularly acclaimed. This Second Edition of The Cambridge Encyclopedia of the English Language has been fully revised for a new generation of language-lovers. The book is longer and includes extensive new material on world English and Internet English, in addition to completely updated statistics, further reading suggestions and other references. 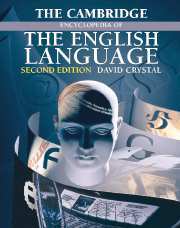 First Edition Hb (1995): 0-521-40179-8 First Edition Pb (1997): 0-521-59655-6 David Crystal is a leading authority on language, and author of many books, including most recently Shakespeare's Words (Penguin, 2002), Language and the Internet (Cambridge, 2001) and Language Death (Cambridge, 2000). An internationally renowned writer, journal editor, lecturer and broadcaster, he received an Order of the British Empire in 1995 for his services to the English language. Prefaces; 1. Modelling English; Part I. The History of English: 2. The origins of English; 3. Old English; 4. Middle English; 5. Early Modern English; 6. Modern English; 7. World English; Part II. English Vocabulary: 8. The nature of the lexicon; 9. The sources of the lexicon; 10. Etymology; 11. The structure of the lexicon; 12. Lexical dimensions; Part III. English Grammar: 13. Grammatical mythology; 14. The structure of words; 15. Word classes; 16. The structure of sentences; Part IV. Spoken and Written English: 17. The sound system; 18. The writing system; Part V. Using English: 19. Varieties of discourse; 20. Regional variation; 21. Social variation; 22. Personal variation; 23. Electronic variation; Part VI. Learning about English: 24. Learning English as a mother tongue; 25. New ways of studying English; Appendices; Indexes.